The hardest part of living well is making changes to your life that you can maintain on a permanent basis. If you’re tired of failing to stick to a healthy lifestyle then here are some pieces of advice that could help you on your mission of following a lasting routine to protect your long-term health. Keep your diet and exercise regime consistent. In order to follow a lasting routine that will protect your long-term health, you need a consistent diet and exercise regime. You can’t maintain a balanced state of wellbeing unless you follow a long-term eating and exercising schedule. Trying a short fad diet for a few weeks is pointless. If you just end up returning to your original diet then you’ll pile the weight back on, and fluctuating your weight on a constant basis is unhealthy in itself. Instead, take the long-term route to gradually improve your weight level and overall health. You’ll get lasting results. As we’ve discussed on this blog before, you need to hone your diet if you want to get into good shape. The food you eat links closely to your workout routine too. If you’re running a lot every day then you’ll need plenty of protein in your meals to keep your energy levels high. You just need to find balance in your daily routine. Keeping the body hydrated is an essential part of daily life. Without water, the body struggles to lubricate the joints, maintain a healthy temperature, and remove waste. Direct knock-on effects of this happening are migraines, weight gain, and tiredness and fatigue. An H2O shortage is incredibly dangerous which is why dehydration is a constant battle everyone needs to fight. Unfortunately, you might be losing the war. According to research, 50% of kids and teens aren’t getting the hydration they need, and adults aren’t far behind. This means you and your children might be at serious risk of health problems. And, the season doesn’t matter. Summer is an obvious sticking point, yet winter is also hazardous as people shirk their responsibilities. Whether it’s June or January, your body generally needs the same amount of H2O to function. Because you don’t want you or your family to experience problems, it’s essential to start drinking more water. However, it’s not always easy to do as thirst is a bad indicator. Therefore, people leave too late. Thankfully, there are strategic ways to take water on board. Continue reading to find out more. In life, it can be hard to make good choices all the time. Sometimes, you have to give in and indulge, and there is nothing wrong with this. You should however note that if you don’t try and keep track of the decisions you are making then this can have an impact on your health, far more than you realise. You have probably heard a thousand times, that it is so important to exercise. There is more than one reason for this. Exercise doesn’t just protect your physical health, it helps you to protect your mental health as well. It is fantastic at reducing muscle pain and it releases endorphins which can help with depression and even anxiety. At the end of the day, there is not a single exercise that will work for everyone. You have to choose one that works for you and go with it. Start out by doing it in the mornings, and have weekends off. As you become confident, you can then increase the intensity, and this will help the benefits to become more apparent. You may think that smoking may help your mental health, for example, when you are anxious or stressed. This is not the case at all, and studies have shown time and time again that quitting smoking can really benefit your mental health. When you smoke, you take in a ton of toxins and this can contribute to mood problems. It can also lead to frequent colds, heart disease and even difficulty exercising as well. If you want to stop smoking, then check out CheapVapingDeals.com. Doing away with clutter can at times get really confusing. In this enlightening article, we shall explore some four easy steps that you ought to follow in your home decluttering journey. The above listed 4 easy to follow and implement steps will with no doubt help you declutter your home. Having listed them, let’s us delve into the specifics of each. In the United States, there are approximately 48 million people who are suffering from hearing loss, according to the Center for Hearing and Communication. Unfortunately, only about one in five individuals who could benefit from the use of a hearing aid will get treatment for their hearing loss. This is mainly due to the negative stigma that surrounds the use of hearing aids. If you suffer from hearing loss and don't have a hearing aid, here are four ways that your life will change for the better with a hearing aid. Your life, like your hearing health, is continually changing. Your physical health, family situation, and social activities can all impact your hearing needs, as well as cause you to consider new ways to address your hearing loss. A qualified audiologist, can analyze your current needs and find the perfect device that will meet them all. Many doctors will continue to monitor your hearing loss and make any adjustments you may need to keep you hearing the world around you. The invention of the smartphone was a beautiful thing. It reminded us that the world was still progressing and that one day we really would have Star Trek technology, even if things didn't develop on all fronts in a linear fashion. No, we don’t have teleportation devices or mind control, but we do have a plethora of exciting technologies, like real-time satellite navigation and pocket-sized supercomputers, which seemed like science fiction just twenty years ago. But as with any significant change in our lives, there are good things and bad things. Smartphones have helped make our lives immeasurably easier in many ways, but they could also be damaging our health. Let’s take a look at how. Researchers in the study of nutrition often talk about the importance of the “primordial environment.” By primordial environment, scientists don’t mean the soup in which early life supposedly evolved on Earth - they mean the context in which children spend their formative years. Activity levels and dietary habits are often cemented in the first few years of life and last a lifetime. Staying up late on weekends and then enjoying a lie-in the next morning is a common pattern for many of us - but, unfortunately, it’s a tradition that research indicates you should seek to break. Numerous studies have concluded that changing your sleep schedule on weekends can greatly impact well-being, causing a condition that has been termed social jetlag. It’s, therefore, best to try and get into the habit of maintaining a steady sleep schedule - going to bed, and getting up, at the same time every day - in order to greatly improve your well-being. What do we want from our homes? First and foremost, we want them to be comfortable. Our house is more than just a place to shelter from the elements; it’s the place where we recover the energy that has been lost to the wider world, and we can’t do that if it’s not comfortable. Alas, sometimes out home doesn’t play ball. It doesn’t provide us with the level of comfort that we’d like. Below, we take a look at six such things that can derail the comfort levels: if you have a problem with any of them, then take steps to resolve them. A home might look inviting and cozy and all the rest, but looks can be deceiving. If the house has temperature issues, then it’s going to be difficult to fall into the deep level of comfort required to be fully at ease. Of course, it’ll depend on the time of the year whether the home is too hot or cold. The majority of problems stem from being too cold - people seem to handle the heat alright, or at least better than the cold. If your home is too cold, then take steps to bring the heat back: insulation, home-heating hacks, and more blankets that you can shake a stick at will all help. For many families, the kitchen is a gathering location to eat, do homework, and spend time combine so it is vital that your kitchen is huge. If you have a little kitchen and want to renovate it can be a nightmare because there are lots of plan, ideas and concepts that you cannot do with a little kitchen that you can do for a big kitchen. On the bright side, a smaller kitchen renovation can have its own benefits and advantages, one of which is an affordable to renovate. When talking renovation it could mean something as little updates to a full kitchen makeover. Today, we’re discussing a topic that has become increasingly important to many of us. Now, you may wonder – how is pain back important? Now, a sedentary lifestyle has been described as the one where a person spends a lot of time sitting, whether for work or leisure and doesn’t engage in nearly as much physical activity as they should. We feel back pain in different areas of the body, and while for some, this pain may be acute, for others it’s chronic. Therefore, today, we’re going to get to the bottom of things – why we experience back pain and where, and most importantly how to say goodbye and good riddance to it. They say that sitting is the new smoking – the plague of the 21st century. Now, a sedentary lifestyle has been described as a “type of lifestyle where an individual does not receive regular amounts of physical activity.” Now, aside from numerous other negative effects it can potentially have on your health, a great deal of sitting can take a toll on your spine as well. Namely, it most commonly causes both lower back pain as well as neck pain and tension in the shoulders. The reason it mostly ‘hits’ those areas is simple – most of modern-day jobs involve sitting on a chair, with a computer in front of you, and when you do this 8 or more hours a day, it’s completely normal to start feeling this kind of pain. Now, the good news is that this ‘sitting disease’ can be beaten or nipped in the bud easily – with exercise. The best part is, it doesn’t even need to be grueling exercise – as many as 10k steps will be enough to neutralize the hours of sitting, so just get up, and start walking! Separation or the breakdown of a genuine relationship is constantly intense, regardless of whose choice it was or what occurred. Regardless of whether you have both concurred that it's generally advantageous, and you realize that you've settled on a choice that will one day make you more joyful, it's hard. You're not simply vexed about the loss of the relationship, you lament for the existence that you thought you'd have, and the family you needed to give your children. When we have children with somebody, we trust that we'll be as one until the end of time. That we will have the capacity to bring our children up in a cherishing and stable family home. That we'll never contend or battle, and we'll generally be glad. This is improbable. All families battle and all couples differ now and then. Regardless of how close you are, it's human instinct, and it's useful for your children to see that even the most joyful of couples have their good and bad times. After divorce or breakups, there are things to keep in mind, you can't care for your kids in the event that you aren't taking care of yourself. Here are some tips to make you feel better along the way. You can't care for your kids on the off chance that you aren't taking care of yourself. In this way, take some time. Address a cooperative separation lawyer, invest some energy with your loved ones, treat yourself, see an advocate in the event that you figure it will help, and by and large discover approaches to unwind and improve yourself feel. Indeed, even the friendliest of breakups can get chaotic. There will no uncertainty be times that you need to shout and yell. That is absolutely typical. In any case, do whatever it takes not to do it before your kids. Your family and companions will need to be your ally and for legal help look for tampa divorce lawyer that can help you all legal matters. It's critical that they don't talk gravely of your ex before the children either so have a calm word. In the event that conceivable, all go out for lunch together once per week or have your ex-accomplice around for tea. Definitely, let them take the children out alone, but at the same time, it's an amazing plan to give your kids a chance to see that you are as yet a family, only an alternate one. Clarify that you'll both still associate with when they require you and demonstrate to them that you can get to know one another without battling, so they don't stress over occasions like school plays when they will need to welcome you both. One issue with getting to know each other and being considerate is that it can give your kids any expectation of a compromise. On the off chance that there is no possibility of this, disclose it to your youngsters and additionally, they can get it. You can demonstrate to them this by keeping a separation. Try not to embrace your ex or sit beside them at the table. Be amicable yet make the physical distinction unmistakable so they can tell that the relationship has changed. Now on its sixth year, the annual Get Together party of the Filipino Bloggers Network (FBN) together with Metrobuzz Bloggers have become bigger and brighter with more sponsors and partners giving their support to two of the most active blogger groups in the country today. Salu, a popular Filipino cuisine in Quezon City, will be hosting this year’s gathering of bloggers and online influencers on January 05. FBN and Metrobuzz members anticipate the annual gathering as an opportunity to make new friends and catch up with old pals they have not seen for a while. Representatives of different PR groups and brands will also grace the event to personally thank members of the online community who have supported them in the past years. FBN currently has almost 2,000 members and continue to expand as it provides a venue for Filipino bloggers from around the Philippines to interact with other members from different parts of the country. Moderating the discussions and posting opportunities from several brands for the Filipino Bloggers Network is co-admins Divine RC and Richard Mamuyac and for MetroBuzz is Lariza Garcia. 30s is a new phase of life which you need to embrace gracefully. When it comes to styling hair, you would get plenty of options that will look great on you. However, you have to keep certain aspects as to what would suit your personality or the time you can afford for its maintenance while settling on a particular hairdo. Now, let’s have a look at the various options from where you can choose one for your hair shaping. Long hair is never off fashion. If your hair is in good condition, you can try for bangs on the sides which will look absolutely gorgeous. For maintaining long and beautiful hair, try to avoid too many chemical treatments that can ruin the quality of your hair. Also, go for the straight hair look which will complement the side bangs of your hair. Shoulder length messy hair is another hairstyle which you can try in your 30s. It gives out a casual and unfussy look. Moreover, you can get the sophisticated look by blow drying it which would absolutely look great both for working professionals or busy moms. Single women can carry this look too which would bring their chic and sassy side out. For the perfect look, you can air dry it with a few spritzes of sea salt spray. Nowadays, short pixie haircut is common among most modern women. This easy to maintain haircut has become popular among them which accentuate a great bone structure, pretty eyes, and full lips. So, if you are a trendsetter looking for ways to make an impression on people’s mind for your great chic sense, go for this pixie haircut which will complement your matured look with the onset of your thirties. Coloring it in gorgeous red is another option you can avail when it comes to styling your hair. Confident women in their thirties can carry this bold and effortless beautiful look that would match their strong personalities. In case you have lackluster hair, worry not; as you can get numerous options in hair extensions or hair weaves that would match the quality and color of your hair. Clip in hair extensions is another option when it comes to styling your hair. Many women in their thirties lack volume in their hair. If you have the same problem, you can try having this cheap clip in hair extensions product which is easy to wear and gives out a stunning look. So, you do not have to worry if you have a party to attend or a get together with your friends. Just put on this natural hair and you are ready to hit the floor. Wondering from where to get these beauties? Well, hairgets.com is the place from where you can find your solution. Now, as you have decided to buy hair extensions or weave to make yourself pretty and attractive, click here to buy the products at an affordable price. 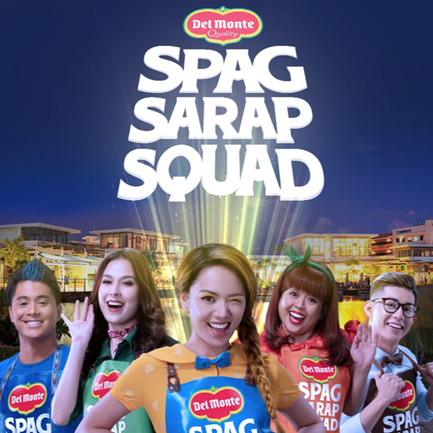 Report to the Del Monte Spag Sarap Squad Headquarters and take on the mission to experience the 5 Delicious Del Monte Spaghetti Sauce flavors and save the day! Last December 13, 2018 at Mall of Asia Music Hall, Del Monte Spaghetti Sauces treated families for the second time to an excitingly different spaghetti experience by sampling all five of their delicious spaghetti sauce flavors in their Del Monte “Spag Sarap Squad Headquarters” – Carbonara, Italian, Sweet, Filipino, and their newest flavor, Creamy and Cheesy. These flavors came to life through the Del Monte Spag Sarap Squad heroes whose mission is to save the day with delicious spaghetti. The squad – Carlo Carbonara, Taliana, Sweetie, Ino Filipino and Chessy, interacted with the audience and hosted fun games to help them experience a variety of delicious flavors – Sweet Style, made with 100% naturally sweet California tomatoes is everyone’s yummy childhood favorite; Filipino Style is a leveled up sweet sauce because it’s also meaty and cheesy; Italian Style is a tomato-ey sauce with basil, oregano and parmesan cheese for that authentic Italian taste; Carbonara, an up & coming comfort food favorite for resto-going yuppies as its made of real cream and milk; and lastly, Creamy and Cheesy – an “extra fun” sauce because of the extra cream and cheese in it! Online shopping is the best choice of all people i asked when it comes to buying their fashion needs, I came across this site Chamaripa an online website store specialize elevator shoes for men and women who love to increase their height in a comfortable way. CHAMARIPA is named after the master shoemaker. What is the elevator shoes? Elevator Shoes are shoes that have thickened sections of the insoles (known as shoe lifts) under the heels to make the wearer appear taller, or "elevate" them as the name. Unlike high heels, elevator shoes make you taller in a comfortable and fashionable shoe. Ordering is safe and secure because the site is safe there's no need being afraid. Buy Your own elevator shoes now for a comfortable and fashionable invisible height increase you've wanted just like me. There is plenty of pressure on the amount of urban living space available and that means you will often need to get creative when it comes to making the most of the room size that you have to work with. Here are some ideas to help you get creative, including why it pays to choose your furniture carefully, suggestions for choosing the right seating, and how your choice of curtains can have a positive impact on your room design. One of the best design secrets that you can use to your advantage when faced with a challenging amount of living space is to carefully select your furniture so that it is in proportion to the size of the room. It is also a good idea to take your time choosing furniture that is not only to scale but can serve multiple purposes too. Use wall sconces to save valuable floor space and club chairs or tight back sofas are often good seating options without compromising on comfort. Another great way of making your room appear as spacious and appealing as possible would be to concentrate on highlighting the room’s best features. If you have an attractive fireplace in the living room, make that the focal point of attention and design the room around it.